A "liquidity trap" differs from the standard liquidity problem and this causes some confusion. That is why it is important to look a little closer at these two terms and what they represent. To many people the idea that to much money could make it a worthless commodity is abstract and difficult to comprehend. A 'Liquidity Trap' is a Keynesian idea and a term flowing from the Great Depression of the 1930s. 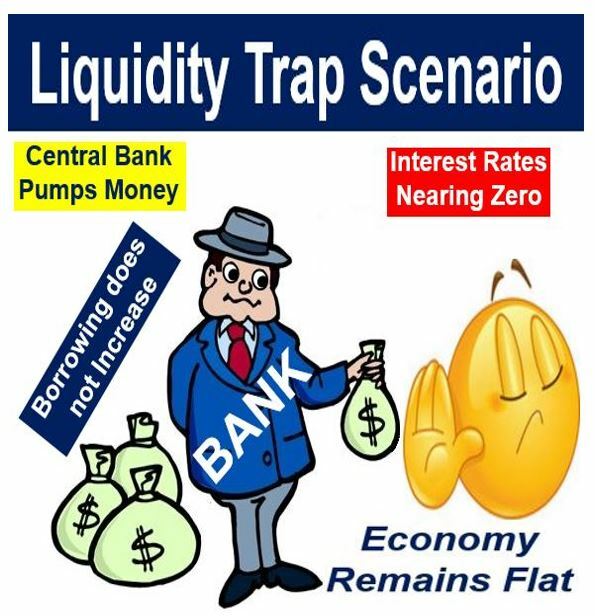 The term, liquidity trap describes a situation in which policy interest rates, having reached the zero bound, are unable to stimulate demand. When expected returns from investments in securities or real plant and equipment are low, investment falls, and it is very difficult to generate growth by adding additional stimulus. A sign that the financial sector is constructing such a trap is the appearance of a great deal of malinvestment, leverage, and speculation. On the other hand. the standard liquidity problem resulting from a lack of money flowing into a market is something we are more familiar with and easier to get our heads around. It generally forms at times of uncertainty or when the risk becomes so great the cost of capital flowing into a market becomes too high and investors lose faith they will see a return on their investment. Simply put when faith exits the marketplace liquidity often follows so closely it leaves us debating which left first. While it may seem subtle at first the difference between a liquidity problem and a "liquidity trap" is important in that each impact the economy in very distinct ways. Corporate debt and especially high-yield debt issuance have exploded since 2009. In his article, Mauldin sights a fascinating article written by Gavekal’s Louis Gave titled, “The Illusion of Liquidity and Its Consequences.” In his article Gave pulled the numbers on corporate bond ETFs and compared them to the inventory, trading desks were holding and found dealer inventory is not remotely enough to accommodate the selling he expects as higher rates begin to take their toll. This is what both these fellas indicate may leave bonds in a situation where they collapse in a panic wave of selling when it comes time for companies to payback or rollover the massive amount of debt they have accumulated. The crux of this piece is not only to point out the difference between the illiquid situation above but to point out how this has the potential to become the kind of "liquidity trap" we have been warned about. The fact that central banks across the globe have all signed on to and deployed " loose money policies" for almost a decade has made them even more impotent than they were in the 1930s. Part of understanding all this comes to how we define the terms "cash or reserves" and to wrap our heads around what debt really means. Economics is a rather puzzling science where plans often go awry when released into the markets and the real world where unintended consequences play havoc with wishful thinking. In reality, this could be the result of few economists having a deep understanding of debt and the true magnitude of risk it transfers to the lender. This all flows into the bigger issue of how the promises of pension funds and annuity payments play into our debt structure. A liquidity trap occurs when a central bank feeds cash into the private banking system and that money is hoarded, rather than being put to constructive use this can raise concerns about the likelihood of deflation and falling demand. Currently, huge infusions of cash from the Federal Reserve by way of its quantitative-easing programs have not created real growth and the job market has yet to recover to the point where all of those who lost their jobs as a result of the financial crisis have been drawn back into find full-time employment. I use the term "drawn back into" because without enough incentive to work or as a result of changes within our society many people have chosen to sit on the sidelines which gives us our current figures of low unemployment. The low participation in the workforce has been used by those of us questioning narrative that all is well. Thus far, much of the money we have pushed out into the economy has not been used or deployed in the way central banks desire resulting in a buildup of capital in the reserves of depository institutions. This means depository institutions alone have accumulated massive excess reserves, this is money that is sitting on the sidelines rather than being loaned out into the economy. It should be noted that banks holding more in reserves does little to make the true economy, which is measured on Main Sreet more robust. Also, much of the money has been funneled into the stock market or speculation that props up the value of assets rather than into private sector growth. The European Central Bank embarking on a similar course when President Mario Draghi announced that the ECB decided to lower the key interest rate as well as opening a €400 billion ($542 billion) "liquidity channel" to boost bank lending. The ECB has also undertaken an asset-purchase program, similar to the Federal Reserve's bond-buying agenda. Japan with its program known as "Abenomics" has also unleashed a massive quantitative-easing program and so has China. This means the world's leading economies are slipping into a liquidity trap increasing the risk that any sort of shock to demand or supply could send the entire global economy into a tailspin. Usually, in a crisis, this forces investors and people in general into the ugly situation of having to sell which reinforces the reality that in a bear market you sell what you can, not what you want to. Footnote; This is part one of a two-part series. Part two explores the way a liquidity trap might play out and explore who could be the big winners and losers. The link to part-two can be found below. Stupid To Hold Cash? I Think not!